In a perfect world I would be using riven stock for building stools and chairs, but my world is far from perfect. So I make do with sawn stock. Which means that I have to be creative when milling stock to obtain pieces with straight grain and minimal run out. As a result, I end up with a fair amount of off cuts. Since I’m too frugal to throw them out I’m constantly trying to find ways of using them up. Otherwise I would soon be drowning in little bits of wood. Which brings me to the project at hand. The two Shaker style stools that I just completed resulted in yet more off cut pieces for the ever growing pile. So to continue with the theme and to use up some scraps, I sat down and worked up a proportional design for the ubiquitous Shaker footstool. There probably have been thousands of these little stools built over the years. I think this attests to its utility and ease of construction, as well as its broad appeal. Even though I have been on a bit of a stool building spree as of late, I think this one will be a good addition to the stable. A classic little stool that can be built in the simple Shaker style or jazzed up a bit at the lathe. A bonus is that I’ll have another chance to practice weaving a fibre rush seat! Since I anticipate building several of these (they should make great gifts) I first spent a little time making a proper story stick. I knifed in the lines, rubbed in some instant coffee and gave the stick a coat of oil. With the story stick in hand, I milled up and cut to length the four legs and the eight rungs needed for this little stool. I tackled the rungs first. Step one took place at the shaving horse. Transforming them into rough octagons and then to rough cylinders. With the roughing done they went onto the lathe. I also managed to knock out one of the legs before calling it quits this evening. I’ll finish the other three legs tomorrow and maybe even get this little stool assembled. This entry was posted in Shaker Stool 128 Mod and tagged footstool, shaker stool, Spring Pole Lathe. Bookmark the permalink. 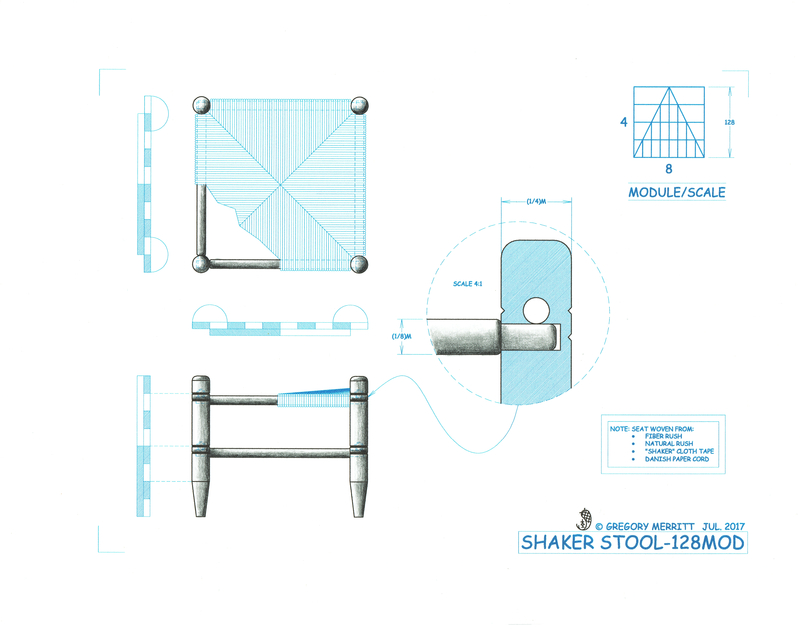 I’m enjoying the shaker stool series! Pretty classic design, and the woven seats look great! I made a footstool once with a wooden top that I shaped a bit…still not that comfortable. The woven seats look like they’d sit a little nicer. 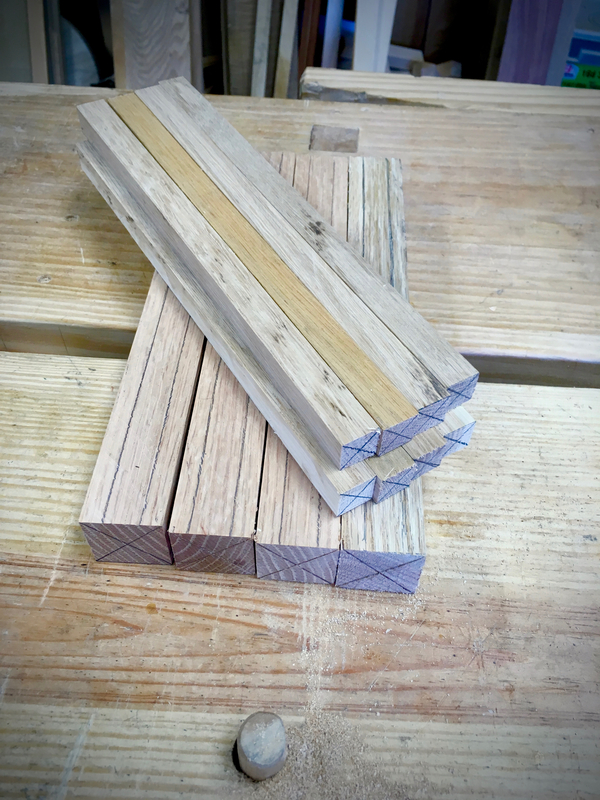 The process of riving wood is fun, and probably makes it easier to end up with a sturdy end product, but it can take a bit more time to arrive at the finished product since you have to let the parts dry for a while. 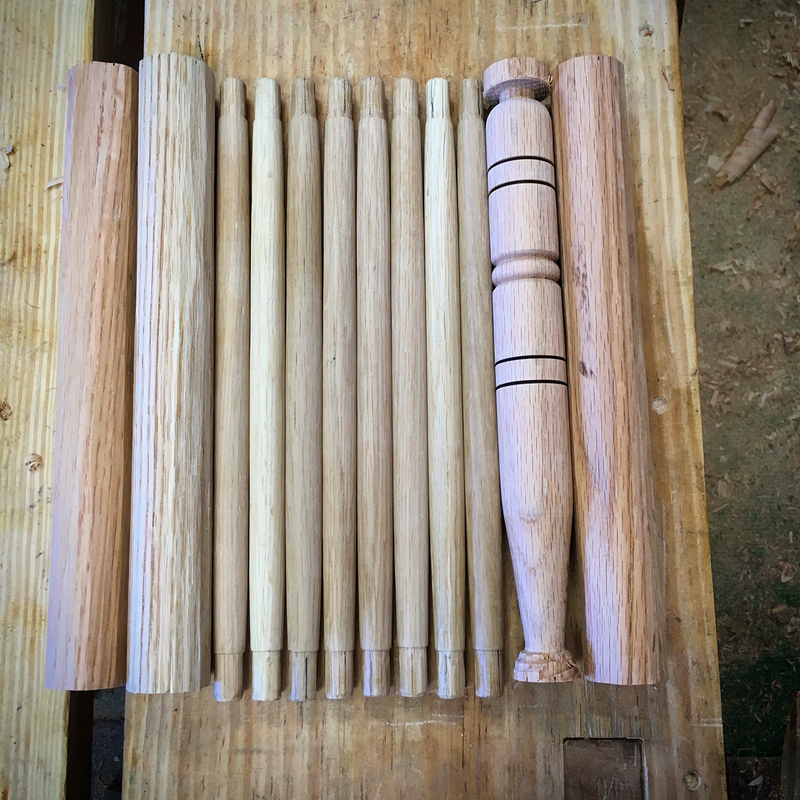 I actually have a bunch of parts dry now… Was going to shave them round, but now I’m waiting to shape them – want to build a pole lathe first! Maybe in the next couple months – I’m not as disciplined as you, I don’t think. Hey thanks Jeremy. Glad you are enjoying these builds. Build the spring pole lathe! I new I would enjoy having one, but I’m surprised by how much I enjoy it. Lots of fun! Yea, green woodworking can definitely be messy. I have only done it on a pretty small scale, so have been able to keep the mess to a minimum, plus I know someone who owns a wooded area that I can use do dispose of shavings, chips, and offcuts. I am always bringing home branches to make spoons from, and I brought home a few rounds of a really nice, straight walnut tree that someone gave me. If I had to go to go to a place where they actually sell logs and buy a whole log… I’d probably be using sawn lumber too. Unless I needed to make a lot of chairs.